Volume is an important criterion in day trading stock options. As options trader I need to pick up stocks with both volume and liquidity in order to easily enter and exit trades during the same trading session. Without them it either becomes expensive to day trade due to large bid-ask spreads or it does not even make sense trying. The shorter the trade timeframe the more important these criteria become. 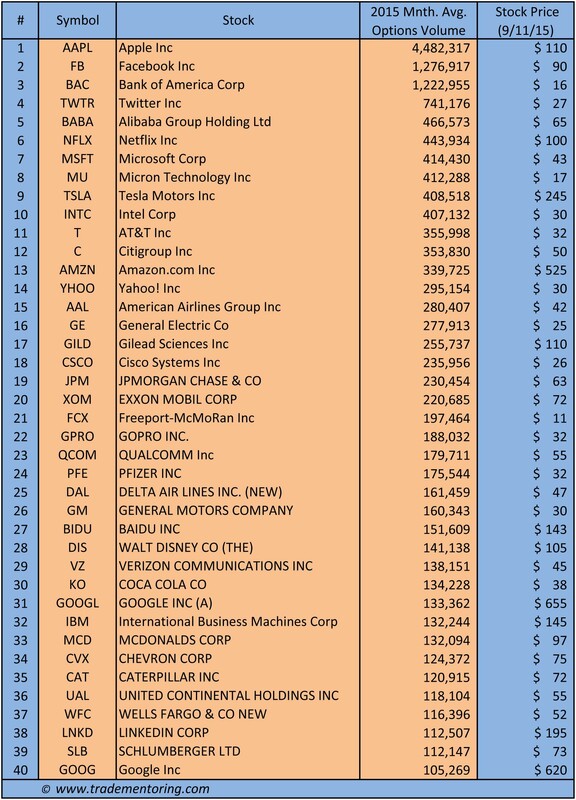 The table below shows my Stock Options Watch List of Top 40 Stocks. Their options have both volume and liquidity, attractive bid-ask spreads and they tend to form very tradable, highly probable chart setups. I use these stocks in both income trading and speculative parts of my options portfolio. When it comes to volume I like to use the information that the CBOT (Chicago Board of Trade) makes available on its site. I use monthly options volume for each stock and I figure out the average of the first seven month of 2015 (January through July). Using averages helps me to skip trading options that have good volumes occasionally but not on constant basis. Looking at the volume is just the starting point of a more relevant selection. The CBOT does not show how liquid these options have been intraday. I do my homework here and observe options intraday charts. I do it for different strikes and expirations. Options chain observation is the way to filter stocks out based on bid-ask spreads as well; this is a real cost for the options trader. I look at various expirations (both monthly and weeklys) and strikes (usually starting from ATM out towards the OTM and ITM options). A very important factor in selecting these stocks and keeping my Stock Options Watch List updated is how chart-setup-friendly these stocks are. This is about their “capability” to form chart setups that I can trade with high probability to win. I’ll dedicate a separate article to this criterion in the near future. I’ll also talk about day trading ETFs on indices (SPY, QQQ, IWM, DIA) or commodities (GLD, SLW, USO, UNG), etc. Markets are dynamic so I update my list every quarter or more often. Due to changes in the factors mentioned above some stocks leave the list while others join it. Addressing these factors properly and putting all these criteria together are best practices for successful day trading options. It can lead to having a win/loss ratio of 8/10, that is eight winning trades out of ten. Have your own stock options watch list and keep it updated!